Are you ready for the new season of Knightfall? History just released a new image of Mark Hamill (see above) from the TV show’s second season. Season two is currently in production. History has not yet announced a premiere date. New York, NY – September 26, 2018 – Mark Hamill (Star Wars, BAFTA-winning voice of The Joker) is going from lightsaber to sword in season two of HISTORY’s drama series “Knightfall.” Today, the network revealed a first-look photo of Hamill in character as “Talus,” a battle-hardened Knight Templar veteran of the Crusades, who survived captivity for ten years in the Holy Land and is tasked with training the new initiates to the Order. 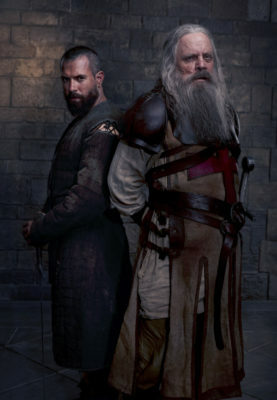 Starring Tom Cullen (“Downton Abbey,” “Gunpowder”) as the courageous and headstrong Templar Knight, Landry, who last season we left grief-stricken but hopeful, season two will explore this dark time in history from the Templar perspective, embracing an authentically grittier, darker, and more brutal Medieval period than has ever been seen before. “Knightfall” goes inside the medieval politics and warfare of the Knights Templar, the most powerful, wealthy and mysterious military order of the Middle Ages who were entrusted with protecting Christianity’s most precious relics. The story of the Knights Templar has never been fully told until now, and “Knightfall” goes deep into the clandestine world of this legendary brotherhood of warrior monks to learn who these knights were, how they lived, and what they died believing. Season two of “Knightfall” is currently in production in Prague. I’m hooked on Knight Fall. I can hardly wait for season 2. I study the Knights Templars so I’m sure I will learn something new about them from the show. I’big fan of Jeremy Renner too. Should be an exciting season. Yes!! Waiting to hear when Season 2 starts. Can’t wait for season 2!! Oh yes, I am definitely waiting for Season 2 to be aired, can’t wait! Thank you.